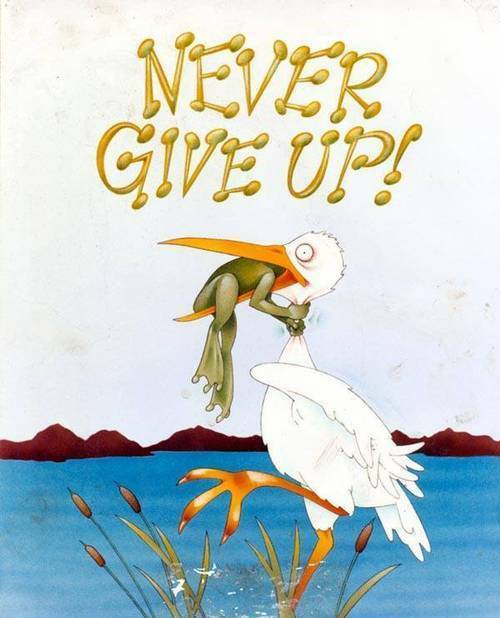 NEVER GIVE UP - The moment you are ready to quit is the moment right before a miracle happens. "Our greatest weakness lies in giving up" - Thomas Edison. The sages say that, “if you are going through hell, keep going”. Rather than looking at how far you are yet to go, why not consider how far you have gotten, so the minute you think of giving up, think of the reason why you held on for so long. Things aren’t always what they seem; greatness isn’t achieved by never falling but rising each time we fall, after all, we all started with knowing nothing. Not getting what you want doesn’t mean you are a failure, it only means that you ought to try harder the next time. You may not get a “YES” right now but could abbreviate the “NO “to “Next Opportunity”. What doesn’t kill you only makes you stronger because hope stays alive as long as you breathe in and breathe out. I once heard, “repetition of mistakes is a decision”; don’t allow today bring you down because tomorrow is pregnant for something great. The best way to keep the flag flying is to be a winner and the only way to be a winner is never to quit. You can be anything you want to be if you put your heart to it; loving what you do and believing it is great work is one sure path to satisfaction. If your mind can conceive it and your heart can believe it, then you can achieve it. I rather start over than give up. Don’t give up, the beginning is always the hardest but it leads to happy endings. If you don’t give up, one day, you’ll look back and be glad you didn’t. Wanting to give up is a test of how much you want something; not giving up is proving how much you do. “Being defeated is often a temporary condition. Giving up is what makes it permanent”- Marylyn Savant. Giving up on your goal because of one setback is like slashing your other three tires because you got a flat one. The past is your lesson, the present your gift and the future, your motivation. There are many things in life that will catch your eye, but only a few will catch your heart, pursue those. Give yourself reasons why you can rather than why you can’t.